Battle Poker is a family-friendly card game with up to four players battling against the clock to make the best five-card hand possible. Battles are played across multiple rounds, and points are scored for each round based on the quality of the hand. 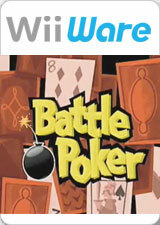 Each player uses a Wii Remote controller to point and click on a standard deck of cards on the screen. The first click flips the card over, at which point it can be grabbed by anyone else. You've got to have fast fingers and eyes to grab the cards you need before someone else snatches them. The graph below charts the compatibility with Battle Poker since Dolphin's 2.0 release, listing revisions only where a compatibility change occurred. This page was last edited on 1 August 2018, at 10:18.